The Indian system of beliefs is based on an intimate relationship with nature. An offshoot of this is the reverence accorded to rivers as a gesture of acknowledgement of their life sustaining abilities in primarily agrarian societies. Perennial rivers such as the Ganges have been held in high regard since time immemorial. This current of acknowledgement runs through the entire subcontinent, as seen from references to the Ganges in ancient South Indian literature. The Story of the descent of Ganga: Ganga, the heavenly river was brought down to the earth through the efforts of the ruler Bhagiratha. Legends related to the Ganga: Several colorful legends are associated with the river Ganga, as related in the Indian epics. Course of the River Ganga: Follow the river from its origin in the Himalayas all the way to its confluence with the ocean, through ancient pilgrimage towns and cities. 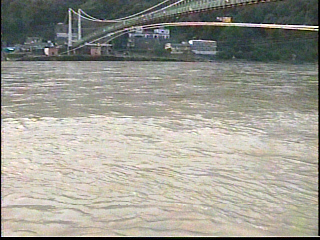 Rishikesh - Gateway to the Himalayas. Experience the might of the Ganges and the serene atmosphere of Rishikesh where all Himalayan pilgrimages begin. Haridwar - where the Ganges is revered. 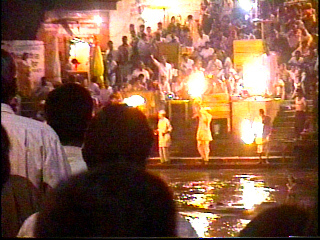 Visit Haridwar in the foothills of the Himalayas and experience the Aarti to the Ganges, when the entire riverside is lit up with the glow of hundreds of lamps. Benares: The most venerated of the pilgrimage sites in India on the banks of the Ganges Prayag- where the Yamuna merges with the Ganga: Prayag, at Allahabad in Uttar Pradesh is an ancient pilgrimage site and is the seat of the Kumbha Mela festival occuring once every 12 years. Tryambakeshwar in Maharashtra - where the Godavari is venerated as the Ganga Ganga Sagar - at the confluence of the Ganga with the ocean is an ancient pilgrimage site associated with Kapilamuni. The river Ganga - as it relates to India today. - A commentary. How does India relate to the Ganges?